My go-to elixirs and smoothies have evolved over the years as my health goals have shifted. For example, I was on a detox kick a few years back, thus my smoothies were lighter and contained more ingredients such as lemons, limes, ginger, and cilantro. When I was working out with heavy weights I consumed more protein. 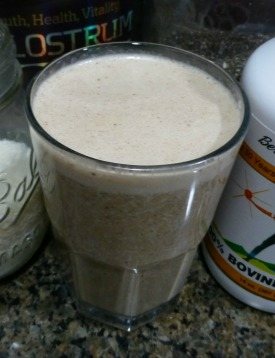 Now I find blended drinks with plenty of healthy fat keep me satiated and full of energy for hours on end. Keep this in mind for yourself. If you’re new to elixirs and feel overwhelmed by the sheer number of ingredients this recipe calls for, check out my other elixirs to get started. My first elixir contained about 4 ingredients. Actually, my first smoothie was milk, banana, and chocolate syrup. I know, chocolate syrup isn’t healthy. I’ve learned a lot since then. Point is, just get started and gradually adjust your blended drinks and incorporate more and more healthy ingredients. This synergistic combination of ingredients is divine, IMO. Substitute your preferred tea or coffee. Enjoy! I’d love to know if you try this eclectic elixir – please leave a comment below. Happy Blending!